Dee of Racked NY and I caught her while running from Lincoln Center down to the Roseland Ballroom for Philosophy di Alberta Ferretti. I love how bold and bright her pants are in this shot. Ashley works for American Apparel, and all of the clothes she's wearing in this shot come from there. When I asked her how she would describe her style she drew a blank, as most of us probably would. "This is hard," she said. "I know," I agreed. Finally, she told me that although she's not from California, she'd describe her style as "Cali summer fun." "I am from California," I told her, though I hope she didn't take this as some kind of proprietary claim over Cali summer fun. I always sort of skipped over the summer fun part of California living anyway. As for her musical taste, it runs towards surf rock, she told me, with a little lo-fi thrown in. "Like, '60s surf rock?" I asked. "Yeah, and some modern stuff too," she replied. I told her to check out the Indonesian surf rock band The Southern Beach Terror, some friends of mine from Yogyakarta.You should too. They're on SoundCloud. Some of you may remember that I profiled Jared Michael Lowe, the writer, journalist, and blogger behind Lowefactor, back in July. You can read it here. I ran into him this time on 15th St. 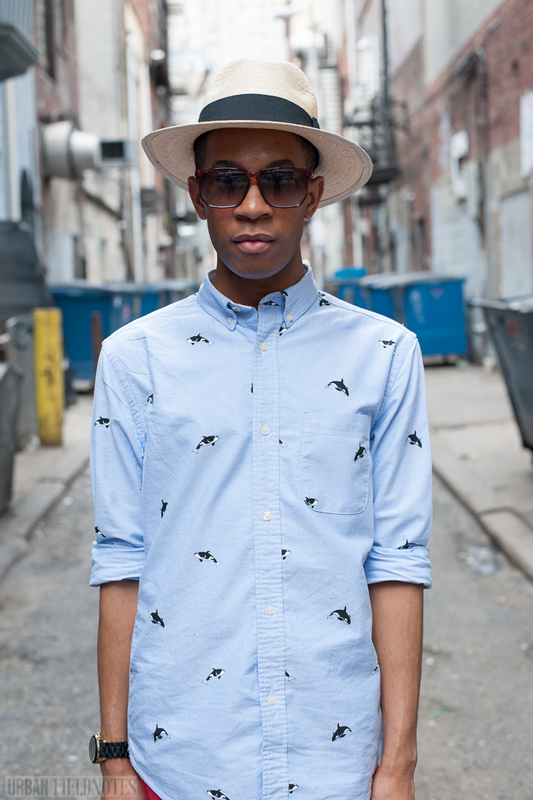 He's wearing a hat by Eugenia Kim, an orca shirt by Hawkings and McGill, shorts by H&M, shoes by Steven Madden, and sunglasses by American Apparel. 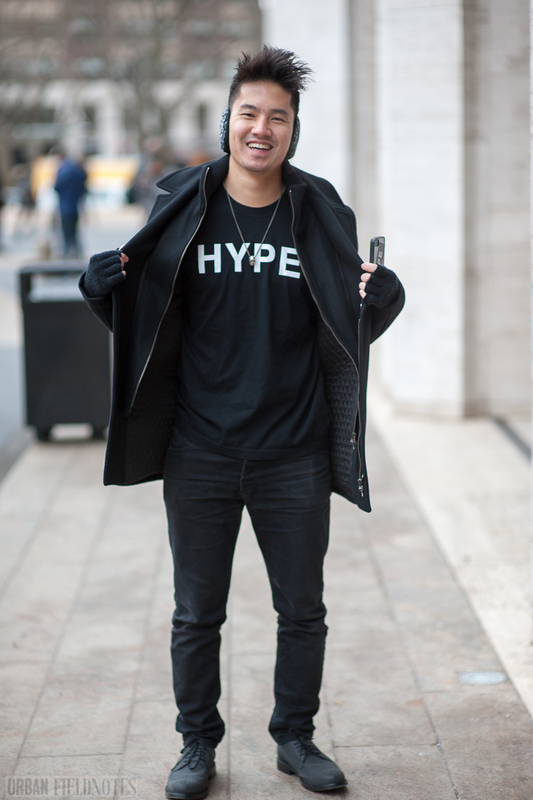 Andy's T-shirt may tell you everything you need to know about Mercedes-Benz New York Fashion Week. Kelsey is a dancer who posts her daily style pics on Instagram. You can follow her at @ivanadance. Her top and pants are both Forever 21. Her shoes are from Target. The bag comes from somewhere in Spain. She picked it up on a trip over there. Shooting today I decided to increase the number of questions I ask people, and hence, add to the number of things I can consider "data" in this project. 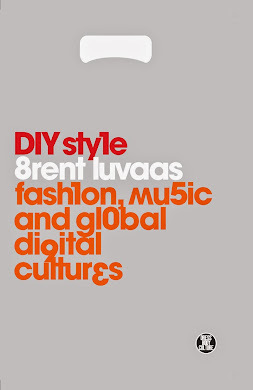 I've been curious for a while about what people have to say about their own style, as well as whether or not there is still any kind of observable correlation between what people wear and what kinds of music they listen to. So I asked Kelsey how she would describe her style. "Eclectic," she said, and then added "whatever I like." As for her musical taste? She described it as eclectic as well, anything from "Vampire Weekend to that popular song where the guy says 'hey hey hey." I have no idea what that song is but if you guys do, let me know. I read an Independent Fashion Blogger post the other day that complained that too many street style shots are taken from the wrong angle, with the photographer either shooting their subjects straight on or looking down at them, giving, in the process, an undue amount of focus to the concrete they're standing on. The writer suggested that photographers ought to be crouched down, making sure that the horizon lines of their image never goes above the waistline of the subject. It elongates the legs of their subjects, and minimizes the presence of the sidewalk. So that's what I did in this image. Does it make a huge difference? I'm not sure. I like the angle just fine. And I think it's flattering to Kaile. But sometimes I like my concrete to dominate my image. 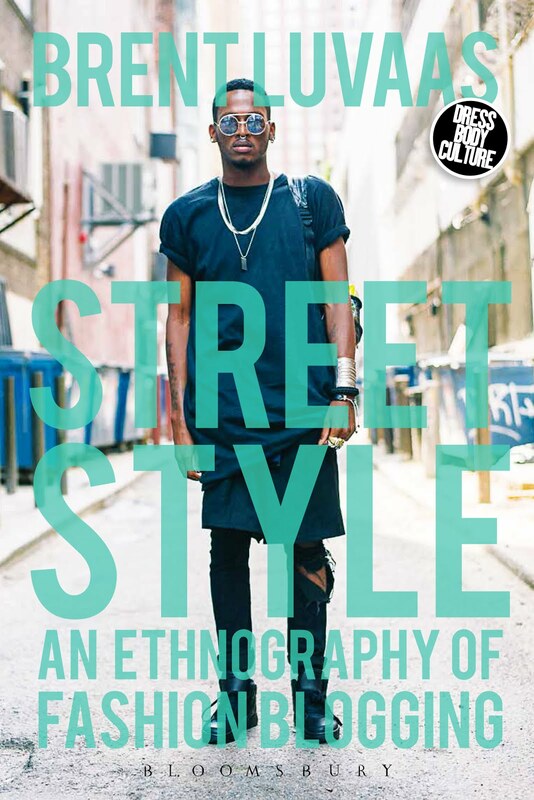 What's street style without a street? Kaile is wearing all H&M in these shots. Amazing how versatile that damn brand is. I found Elle just as I was on my way to the subway to head home. It had not been a good day for shooting street style. It was hot. People were in more casual clothes than usual. And I was in something of a funk. A self-imposed funk at that. I'd started to wonder again what it was I was looking for in my subjects. Bad idea. Once you start thinking on a street style shoot, the chattering takes over, gradually edging out instinct. Pretty soon all that's left is chatter. 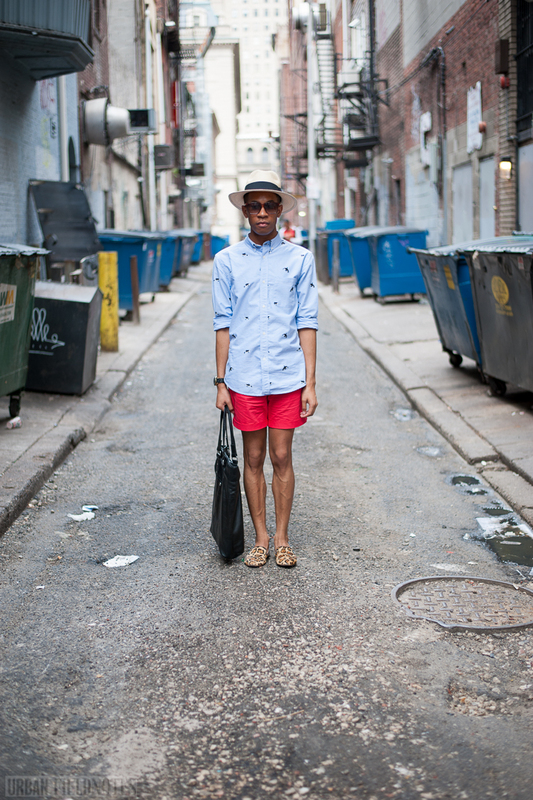 Was I looking for fashionable people for my blog? Edgy people? People in spritely summery attire? Was I looking for people who represent the carefully cultivated brand identity of Urban Fieldnotes? And what is that again? 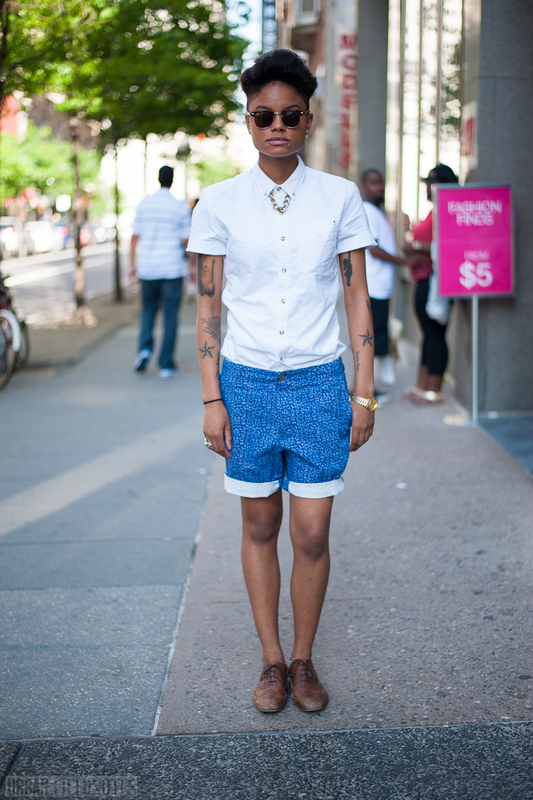 Once you start thinking on a street style shoot you can no longer make decisions. And then it came to me, an epiphany. I was looking for looks that I like. That's all. Nothing more complex than that. I didn't have to be consistent in what I was after. My likes, after all, are not consistent. The only criteria I had to use was whether or not I liked someone's look. It felt like a great weight had been lifted. But what do I like again? It seems like a simple enough question, but when you look directly at your likes, they seem to disappear. And what does it even mean to like something? Is it to have an affinity towards something? To resonate with something? To get pleasure out of something? To desire something? Surely I take pictures of plenty of outfits I wouldn't want to own and plenty of people I'm not attracted to as such. So this whole just having to like someone's look thing wasn't working either. Chatter. Chatter. Chatter. I let go of the liking rule too and went back to my old faithful. I had to feel some kind of immediate reaction to someone, some unnamable pull. But as I leaned against the concrete walls of Walnut St, sweating profusely, practically melting into the sidewalk, my instincts felt slack and lifeless too. I decided to go home. And that's when I saw Elle. Truth be told, I had seen her on Wednesday too but hadn't reached her on time to take her picture. I don't know if instinct kicked in or just the memory of instinct from the other day, but in any case, I knew I wanted to take her picture. Elle's outfit is all Asos. The real pull for me, however, is the beat-up old wing tips. 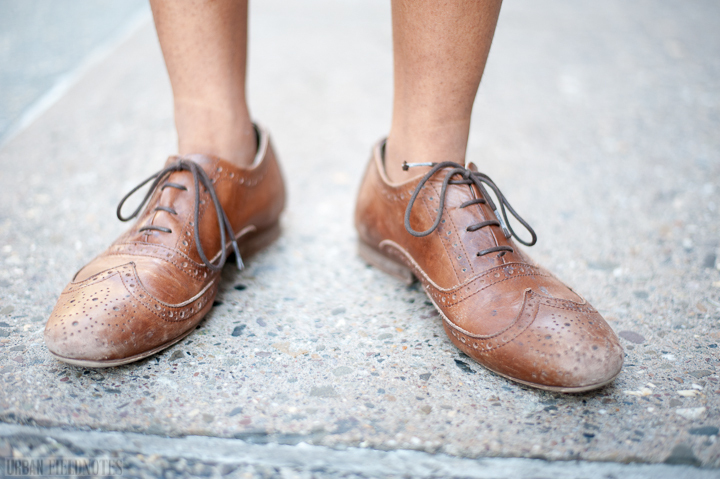 Those are shoes with a patina. This guy walked into Lincoln Center with menswear guru, and ubiquitous street style personality Nick Wooster. "Why are you taking pictures of me?" Nick asked us, posing nonchalantly with his cellphone. "He's the handsome one." No one took the bait then. But then this guy came back around a couple more times. These shots were taken with my new 50mm lens opened to its widest aperture (F1.8). On my 85mm that makes for some pretty lush blur. Not as lush as it gets — my 85mm, after all, opens up to F1.4 (that's even bigger for those of you who don't speak camera) — but pretty lush nonetheless. The bokeh on this lens is much more controlled. The strobe effect is less pronounced with the little balls of light that make up the background blur noticeably smaller, and the subject in the foreground, on which the lens is focused, decidedly sharper. I like it, but it's quite a different thing than I'm used to, and it furthers that illusion of realism I mentioned in my last post. But don't be fooled. The 50mm distorts in its own way. Look at the image below, for instance. The portions are slightly off, even if they may be flattering to the subject. That's called parallax. Whatever is closest to the lens gets magnified. The 85mm, because it requires me to stand so far away, makes parallax barely discernible. Wanda, incidentally, is wearing all thrifted clothes. The tank top is by Joe. She got it at a second-hand shop in Williamsburg. 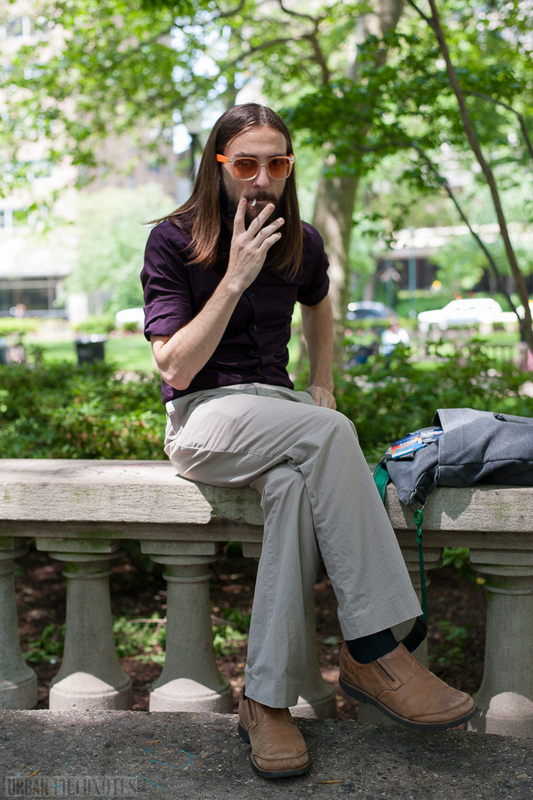 The pants are from Fishtown's own Circle Thrift, the shoes from the local Buffalo Exchange. The sunglasses are Ray Ban. She has no idea what brand the bag is, but she got it on a trip out to Portland, Oregon. She loves the West Coast and is hoping to get back out there soon. Ulyana Sergeenko, the Russian socialite turned style icon, was famous in the fashion world before she was famous for anything in particular, an icon in search of a brand. Now she has her own couture line, one thing leading to another. Fame, it would seem, is a variety of social capital easily converted into other kinds of capital. But hers was not an instant fame, as some of her detractors might suggest. It was hard won, like any other kind of fame, fought on the pavement outside catwalks. She had to win the affection of the street style bloggers before she could charm their readers. I hope in these pictures, shot in succession outside Rodarte at New York Fashion Week, some of that hard work shines through. My favorite part of these pictures? The blurred out photographer in the background. It occurred to me today, when I should have been working on something else, that I still have dozens of perfectly good images from New York Fashion Week that I have not yet bothered to post on this blog. I'm going to remedy that now. I will begin posting these on Tuesdays and Thursdays, and keep Mondays, Wednesdays, and Fridays for new street style pics. I guess I'd gotten bored of my NYFW pics. I wanted to show new stuff, and stuff that felt somehow more "real" to me, as if Philadelphia street style is instantly more authentic and genuine than what is shown at fashion week. And maybe it is. But when the folks at fashion week fake it long enough it becomes the real thing. So here's my first batch of new images from Mercedes Benz Fashion Week Fall 2013. Everyone else is still posting theirs. Why shouldn't I?